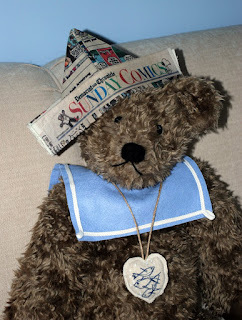 I have finished making the "sailor" bear for little S. I am really pleased with this very big bear, he is more than 24" tall. He is going to live in a warm place and I thought the sailor outfit (a childlike interpretation) was appropriate. 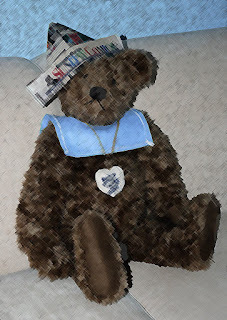 Imagining a resourceful bear, looking for an adventure in play, I wanted a paper folded hat. It is actually made from interfaced muslin that has the comic pages transfered on strategic areas. It is not only a sturdier alternative for an active boy, but is a reminder of the city it came from as well as the date it was constructed. A simple sailor's collar and fishy heart completed the costume. He has a wool felt heart nestled inside his stuffing, with the child's name and date. S. will give him a name! 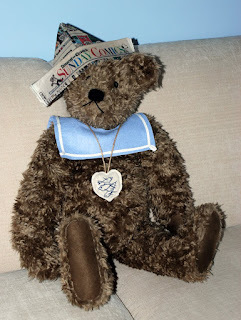 My uncle was delighted with him and will be delivering "sailor bear" for me to a very special boy in his life. P.S. I was having fun with Photoshop in the first picture! Ship ahoy! I love Sailor Bear. Wishing him a "bon voyage"
Bears! I'm so fond of them :). ANd I particularly like the hat and thenecklace. He's really a handsome fellow!